In 1873, William Manning rented the upper stories of a factory building that stood in today’s Millbrook meadow and began to manufacture his newly patented style of parlor organ. 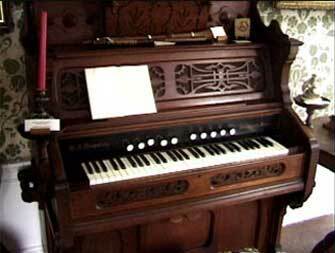 Constructed from black walnut, the moderately priced reed-organs were so popular that demand outstripped supply, but by 1875, after selling only fifty organs, Manning decided to close his business and sold his patent to a Manchester firm. Two of Manning’s organs reside at the museum. © Copyright 2008-2018 Sandy Bay Historical Society • All rights reserved. All work shown on this site is the property of Valentine Design or the Sandy Bay Historical Society. Collage by Kathleen Valentine from the collection of the Sandy Bay Historical Society.